The 29th of this month, in my state of Indiana, the Indianapolis Motor Speedway will host the 100th running of the Indianapolis 500 Mile Race. The Speedway’s important milestone will doubtless spark many conversations about the early years of the track and the pioneers in the sport of automobile racing that have left their mark on the place. Among those pioneers, the name Eddie Rickenbacker stands out; not because he ever won an Indianapolis 500—he didn’t—but because of his amazing life that included a significant contribution to automobile racing and the Indianapolis Motor Speedway. Born in Columbus, Ohio on October 8, 1890 to Swiss immigrant parents, Eddie was, from an early age, a daredevil. By his own count, he survived 135 brushes with death during his lifetime. The first came at age 8 when young Rickenbacker, as the leader of mischievous gang of boys called the Horsehead Gang, slid in a metal cart down a hill into a gravel pit. The cart flipped, slicing his leg to the bone. At age twelve his father died forcing Eddie to quit school and support the family doing an array of jobs from selling eggs and goat milk to working in various local factories. In 1906 at the age of 16, Eddie found his passion when he went to work for Lee Frayer, a race car driver and head of Frayer-Miller Automobile Company, who let Eddie ride with him as a mechanic in major races. In 1912, Eddie joined car designer Fred Duesenberg and began racing cars on his own. Earning the nickname “Fast Eddie,” he participated in the 1912, 1914, 1915, and 1916 Indianapolis 500 races. Though he never won any of those races, in 1914 he set a world speed record of 134 mph at Daytona. In 1916, while preparing for an automobile race in California, Rickenbacker took his first ride in an airplane and was hooked. 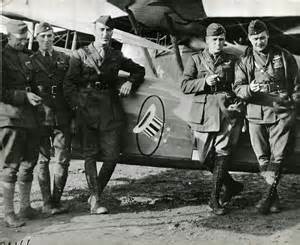 When America entered WWI Eddie joined up, learned to fly airplanes and was assigned to the 94th Aero Squadron, also called the “Hat-in-the-Ring” Squadron. He changed the spelling of his surname from “Rickenbacher” to Rickenbacker, replacing the “h” with a “k” to appear less Germanic. 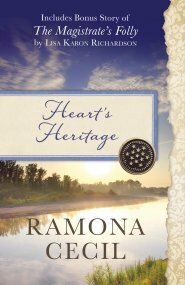 He also adopted the middle name, Vernon, which his parents hadn’t given him, but that he thought sounded classy. Later in his autobiography, he claimed that the change of spelling he made to his last name forced his Rickenbacher relatives to follow suit. 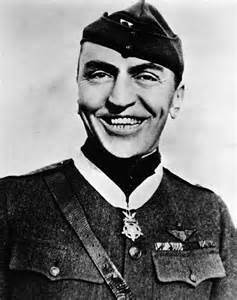 Called the “Ace of Aces,” Rickenbacker’s accomplishments as a WWI fighter pilot won him worldwide acclaim as well as a chest full of medals, including the Medal of Honor. 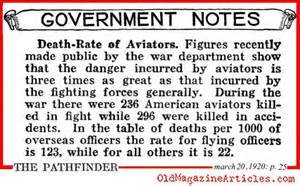 Between April 29th and October 30th of 1918, Rickenbacker shot down twenty-six enemy planes and survived; an amazing feat considering WWI aviators were three times more likely to die than any other combat forces. After the war, in 1920, Rickenbacker started the Rickenbacker Motor Company. Though the company eventually went bankrupt, Rickenbacker helped develop the four-wheel brake system. Interesting that he kept the same "Hat-in-the-Ring logo used by his old squadron. Two years later Eddie, who’d vowed to eschew marriage, married Adelaide Frost Durant, ex-wife of a former rival race car driver. 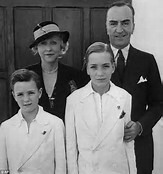 The couple adopted two sons. In 1927 Rickenbacker bought the Indianapolis Motor Speedway and operated it until 1941, closing it at the entrance of WWII before finally selling it in 1945. During the 1920s and 1930s Rickenbacker worked for General Motors and several air line companies, finally taking the helm of Eastern Airlines in 1935. Three years later, he bought the company. 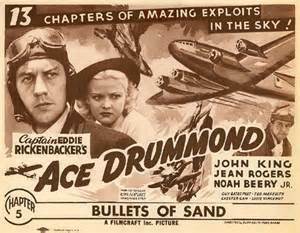 Among Eddie Rickenbacker’s less known accomplishments was the comic strip Ace Drummond, which he wrote from 1935 to 1940. It was in 1942 that Rickenbacker experienced his most famous brush with death. While on a tour of the air bases in the Pacific Theater during WWII, Rickenbacker’s plane was forced to ditch in the Pacific Ocean. 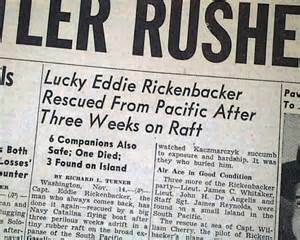 For 24 days Rickenbacker, his friend and business partner Army Captain Hans C. Adamson, and their crewmen drifted at sea in life rafts before being rescued by a U.S. Navy float plane, earning Rickenbacker the new nickname of "Lucky" Eddie. 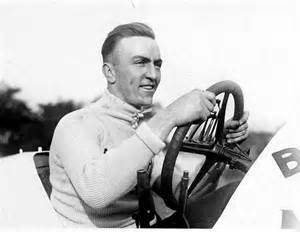 After cheating death so many times throughout his amazing life, Eddie Rickenbacker died of pneumonia following a stroke in 1973 at the age of 83. So should the name Eddie Rickenbacker come up during the celebration of the 100th running of the Indianapolis 500, I will give a mental salute and waggle of wings in honor of the amazing life of “Fast Eddie” Rickenbacker, the American Ace of Aces.